Hi, Story Empire fans. Craig here to kick off this point/counter-point post. This is something new for us, and we hope to have more posts like this. Some of that depends upon the success of this post. We invite all of you to join our discussion in the comments area. Maybe you can add something to this discussion. I think WordPress is the best blogging system out there. They are bigger, simpler, and have more interaction going than competing systems. There is one question that bloggers have to answer when they get started: Free or Self-Hosted? I’m on the side of free. My own blog, Entertaining Stories, is a free WordPress blog. WordPress provides me with multiple theme options, and those are highly customizable. They also provide widgets that allow me to add things like a slideshow of my covers, linked covers that go to the Amazon store, and more. I know the paid sites provide additional options, but I have more than enough to confuse myself already. I have friends with self-hosted WordPress sites. I find them to be extremely difficult to comment on. I have to enter a bunch of data in a form before my comment will go through, and that seems counter productive to me. If you’ve read my posts on blogging, comments and interaction are golden. Without the comments, you might as well have a static web page. Remember my mantra of not giving someone a reason to say no. There are some risks involved in my free site, and I stepped in with open eyes. First is that WordPress actually owns my site. They don’t own my content, but it lives on their site. If they chose to shut me down, I would lose all of my content. I’m a prolific blogger, and there is no way I’m going to give up all that storage space to save a post about my dogs, or my weekly word metrics. I’m also not going to pay for someone to store it for me. I’m taking a calculated risk here. I still have all the photos and cover art on my devices and the cloud. My imagination is my own, and I can write more. The second risk is that a free site will not let me sell directly. I may be fooling myself, but I’ve convinced myself that I don’t sell books. (My royalty payments will prove it.) My blog points to Amazon, and Amazon sells books on their site. Maybe it’s a weak argument, but I haven’t had any problems. All of life is a calculated risk, and this is where I stand. Other Story Empire Authors have made different choices, so I’m going to pass this along to them, and they can offer their own opinions. Ciao, SEers. Staci here, weighing in with my two cents. Thanks to Julie Holmes for asking for more information about self-hosted versus free sites. And thanks to Craig, for his brilliant introduction to the free version. This post is pretty much one long pro/con list about free versus self-hosted sites. The thing I hate about pro/con lists is that I often end up with the same amount on each side. Creating such a list takes me a lot of time and the result is I still have no idea what to do. Isn’t it fitting, then, that in this post, I’m once again in the middle? Let me give you a brief history of my blogging life. This may be repeat information for many of you, but bear with me please. I won’t take long, and then I’ll draw my conclusions, such as they are, once you understand where I’m coming from. I started blogging around the same time I started writing fiction, because, you know, writers need a platform. I tried Blogger first, because it was free and associated with Google, but the format just didn’t click for me. (That blog, pathetic as it is, is probably still out there somewhere.) Then I heard about WordPress in my writers’ group. They debated the merits of paid or free, and the paid version pretty much won. I went home and looked into it. As I hadn’t made any money from writing at that time and I didn’t understand how to set up the self-hosted version, I decided to start with the free one and make the switch when I thought I was ready. I belong to some online writing tribes, and one of them was really helpful to me. Most of those users lauded the self-hosted sites, and I used to get jealous of all their functionality. They had plugins for everything, but I was limited to a few lousy widgets. They finally convinced me to make the move, and they helped me with the transition. I was initially delighted. My site looked so much better, and I had a ton of functionality due to the various plugins I installed. But then it hit the fan. None of my blog followers followed me to my self-hosted site. I wrote posts on my free site inviting them to, but they didn’t. I imported them into my new site, but very few of them came, liked, or commented. I went back to the free site and posted about my move again. And again. I got more followers to the free site I was leaving (isn’t that crazy?) but no transfers to the self-hosted one. I still have my site (stacitroilo.com) on the self-hosted side of WP. It’s prettier, it’s safe to advertise there, and I have the benefit of a lot of plugins that I don’t have on the free site. One of the plugins is a redirect plugin. So if you want to go directly to my blog and type that sub-root in without actually clicking on my blog link, you’ll type stacitroilo.com/blog. It looks like a menu item from my site, but that’s not really where my blog is. My blog is really at stacitroilo.wordpress.com. But I use the redirect plugin to point a false URL to the real one. It looks better when I share stacitroilo.com/blog, though, so that’s what I do. Another plugin allows me to create tables without html coding. It makes the display of my book covers much neater. I have a plugin that creates beautiful sliders. I use it to showcase my teasers on each page site and to do tagline sliders on my home page. The free version does allow for a sliding gallery, but the formatting isn’t as nice. There’s also a plugin I’m fond of that customizes lead generation. I have a bar at the top of my page and a designed pop-up for newsletter signups. I can do something similar on the free version, but it’s not nearly as attractive. Clearly, I prefer the look and customization the self-hosted version gives me, but I’ve switched my blog back to the free side of WP. Appearance and ease of navigation are important, but so is gaining an audience to begin with. That’s why I became a hybrid. I got a lot of my followers back (although not all) when I returned my blog to the free version, and I’ve gotten new followers, too. I think that’s because somehow WP has a community of some sort that allows the free WP users to find each other. I’d love to know how to maximize that potential, because I’d jump in with both feet. I’m sure I’d grow even faster that way. As it is, though, I’m steadily (albeit slowly) gaining traffic. As Craig mentioned earlier, I don’t have to worry about selling on my site, because I own it. I can do what I want there without fear of repercussion from WP. And that is primarily where I do my promo—on my paid site landing page. When I blog promos (which I try not to do too often), I link to my paid site. That way I’m sure I’m on the right side of the terms and conditions of WP use. Hi, SE Readers, Joan here. Like Staci, I started my first blog years ago using Blogger. At the time, I wrote mostly nonfiction, and I had just begun going to writer’s conferences and workshops. I didn’t even know there was a free vs. self-hosted platform, but I recall coming back home and checking into the free site. At the time, I found it to be more limited than Blogger, so I stuck with that platform. A couple of years later I became involved in an online course and the instructor made the same statement I heard years earlier. “You need WordPress.” This was also the time I had decided to devote my writing to fiction, so I started my self-hosted site from scratch. The followers I had on the other site didn’t come over (and frankly, I didn’t expect much because I was switching to a different genre). This time, I did not waste money on a custom design, although I did purchase a theme. (In fact, I’ve purchased at least three, because I grow weary of the same design and like change.) The theme I use now is designed for authors. In addition to a blog, it has a section to showcase my books and provide purchase links. There is also a call out section that I use to link visitors to my email sign-up list. I’ve added other widgets, such as Goodreads, Facebook, and other social media links. Overall, I am pleased with having a self-hosted site. Use the WordPress comment system. I began using Disqus years ago and I don’t have many issues with it. However, on a recent blog tour a few people were unable to leave a comment. Not use a separate system for email followers of my blog posts. By using Mailerlite, I set the time each post notification is sent. WordPress sends automatically as soon as each post is published. Other than those minor details, I’ve been pleased with the self-hosted site. Setting up the site from scratch was relatively easy. I chose Bluehost (no affiliation) as my host site. By using their tutorial, I was able to get the site up and running easily. There are a number of hosting options, so if you’re thinking of starting a self-hosted site, be sure to do your research to find the option that most suits your needs. Craig again to close this up. This is something all authors will have to decide eventually. You need a platform, and blogging is your best plank in that platform. WordPress is the best thing going, but you’re going to have to decide if you want the free site or a self hosted one. Let’s hear from you in the comments. What is your preference? If you haven’t started yet, or are thinking of changing, has one of us swayed your opinion? Great post and one issue I think we have all tackled from time to time (I tackled the same issue on my self-hosted here – http://www.makingyouthink.ca/2015/wordpress-reader-or-no-reader. I agree with your observation, the lack of Reader integration is the killer for any Blogger. I look at Reader as the YellowPages to the WordPress world. Its a quick, convenient and dynamic way to find new and interesting reads and stimulate not only followers / fans but also conversation. That is a great way to explain it. The Yellowpages of the blog world. Glad you liked the post. Hey! I have heard also that you lose followers and visitors when you switch to a self hosted site? I am thinking of going self hosted as I really hate the lack of control I have with my free WordPress but I’m worried I’ll lose potential readers? What is the reason for this do you know? There have been problems with transporting everything, and sometimes your followers just won’t follow you over. Some likely will, some likely won’t. You may have to look at it like a winnowing process as opposed to a loss. I lot of the commercial followers probably won’t transfer. Your regulars probably will. Can’t be sure though. Ah I see! And is your blog still able to be discovered as easily as on the free wordpress? Sorry for all the questions, new to all of this! I, and others like me, have my doubts. Remember, I am the member who cheered the value of the free site. Hope the choice works for you. WordPress is good about helping people. They may not be fast, but they have a jillion users to take care of. They said it would take a few days, so hopefully it will be soon. It’s been a few days already but I’m trying to be patient. I’m just happy that they were able to recover my blog after it crashed and disappeared. A very useful post and lovely to have three different points of view. I love wordpress and am currently using the free version. Now that I know about the commenting “issue” on the self hosted site, I have a better understanding of why I can’t like comments on certain sites and why I don’t receive notifications when the blog owner comments. I like the free version very much but I am worried about space as I am only 1 years into blogging and have already used by over 20% of the storage space. Is there any solution to that? I don’t use gobs of photos, but it stores the photos from every reblog. One day, I may have to go back five years and delete ancient pictures from posts nobody reads. I can live with that. They may also sell more storage space, and I’ll cross that bridge when I come to it. Yes, that is what I have been thinking of doing when the time comes. I’ve been at it for years and it hasn’t happened yet. Great post, gang! Love the comparisons you each have, and the reasons you selected one route or another. And the comments are valuable as well. (I forgot I’d asked about this 🙂 ) Very valuable information. I just had one of my writing sisters ask about buying a domain name, but since I haven’t done that quite yet (and now I should move it to the top of my to -do list), I wasn’t sure how to direct her. Once I do it myself, I’ll know. You’ve given a lot of good pros/cons for each type of implementation, and I’ve bookmarked this post for reference. Thank you so much for sharing your experiences! I love WordPress. It’s an amazing tool and a wonderful community. I started with the free version and Just changed to the Self Hosted recently. The main reason for my change is that I’ve started taking my writing more seriously. So I wanted a .com that didn’t end with WordPress. I just thought is looked more professional. That’s all the reason you need. Hope it meets all your expectations. When I first started, I began with Blogger because that it what I came across first (and it’s free). It’s easy enough to use, though I doubt that I’m using it to its full potential. I created a WordPress account because I was prompted to at some point in order to comment on a blog, but I don’t have my blog through WP. I own my blog name (at least, I pay for the name…lol! ), but I don’t know anything about changing the formatting to another host and keeping the name. I blog because it’s a way to reach more people, but I am very much a beginner in that field. I don’t know that I’d want to try to learn a new system. New systems are a pain, and I don’t enjoy them either. Sometimes we have to bite the bullet and go for it. I recommend WordPress because the community is so much more active. Paul, you’ve made my day. Most of us are feeling our way through the forest on this stuff. We all know what we experienced. When we share it might help someone make a better decision for them. Ask any questions you like, and if I don’t know the answer, one of my SE partners probably will. Thank you Craig, it is deeply appreciated. I have a friend staying he next few days but earmarked some serious study time over the weekend. Hope you don’t mind the slight delay. You and your fellow authors honesty in recounting your experiences is truly helpful Wish I had been savvy enought to search for such clear cut common sense advice when I was starting out. Enjoy your visit with a friend. The whole reason we wrote this post was so people could learn what worked for us and what didn’t. I’m thrilled you’re finding it useful, and I encourage you to reach out to any of us anytime if you have questions. Thanks, Chris. The sharing really helps. I tried several themes before settling on the free WP Fontfolio theme, which gives me exactly what I was aiming for, an all devices friendly, kindle books type display on the home page. I only pay for my .com domain name, which is covered by agreeing to accept WP Ads. I think it’s nice to change things up, but not too dramatically or often. I want people to recognize my site as mine. The custom banner really helps, and even when I change it, it’s still nearly the same. It’s important to pick a good theme. I have to agree with Craig. Theme choice is crucial. I’ve tried to work with themes that I paid for only to discover they didn’t have the look or layout or customizability I needed. I think establishing brand by having a recognizable look is important, too, but that’s a branding issue addressed in another post. Thanks for sharing and commenting, Chris. I don’t understand why I no longer get notifications from this blog or yours, Craig, or other authors. Anyway I am not on WordPress, I am on Blogger, free, but I read all posted here. Interesting things worth keeping in mind in case I want to switch to WordPress. Thanks, Carmen. You might have to subscribe via email or something. But I did, that’s why I got them before. I tried to do it again and can’t. I’ll have to just keep in mind and make a tour of my favorite blogs everyday! Sometimes things change in my reader and I have to readjust settings. I hope you get it worked out. Thanks for commenting, Carmen. Have a wonderful day! I’m free hosted to save money on paying for a site. I can do plenty on the free side and I pay for my domain without going premium by just paying the $15 each year through WP. I’d like to do more but I get plenty out of what I have. Staci makes a great point about making the shift from an original free site and her “hybrid” approach is a sound one. I think if I go to a paid site it will be for the same purposes but it’s important not to lose the followers. It’s a bit frustrating with the limitations at times but I’m not paying anything or the site aside from the yearly domain fee. Low cost lets me put that money into other things that require money (covers and editing) while the site does quite a lot for no cost. I only sell e-books so I don’t worry about selling from my site. If I had print it would only be POD anyway and I wouldn’t sell directly from my site in that instance either. Costs are important to consider. Especially for the beginning writer who isn’t earning much yet. That was the goal with mine – start with low expense and grow it from there. I still get a lot of mileage out of my current site for free so I’m sticking with that for now. Interesting what everyone prefers. I like something simple that works. I get enough custom options to keep me happy, without the temptation to investigate all the bells and whistles. Yes, a simple site can do a lot regardless. A good pro & con post from Craig Boyack over on Story Empire today – leave a comment and join the discussion! Okay, that’s funny. We all have our own reasons, and your’s is just as valid. This was a great post and I loved getting input from all three of you. I once tried to move my free WP site to self-hosting and it was problematic. Now I’m gun shy. I do worry that on the free side, WP is able to come along at any time and shut me down, but as long as I’m playing by the rules that’s hardly likely. WP is an open source platform which is built on sharing. I’m like Don in that I fall in the middle. I pay the premium price for WP which keep ads off my site, pays for my domain name and private domain registration, plus gives me Jetpack, more storage and a few other gizmos I have to figure out. I have to be honest that I get frustrated with Blogger sites that make me prove I’m human. I leave comments on the blogs of friends I follow who use Blogger but other sites I visit at random, it’s too much work to comment. I also honestly have to say I’m not a fan of Disqus and the emails it sends. It’s so much easier to click notifications in WP if someone responds to or likes one of my comments. I will probably move to a hosted site one of these days, but for now I have too much else on my plate to tackle that shift. Especially when the premium plan of WP ($99 per year) delivers what I need. One of the things that hits me is your comment, “…and a few other gizmos I have to figure out.” I think there is a possibility of too many options. I don’t like figuring them out, or dedicating the time to do so. I like what I have. I don’t think they’ll be anything complicated. It’s just the $99 premium came with extras and I haven’t taken the time yet to explore them. I used to pay $35 to keep ads off my site (I did that from almost day one), plus the domain name cost and another $18 or so for private registration (also something I did from day one). When I added all that up, it wasn’t much more to bundle it all together in the premium plan and get a few other bells and whistles along the way. Sounds reasonable to make the leap in your instance. Good information. I’ve had the ad-removal upgrade on my to-do list forever now, and I still haven’t gotten around to it. That upgrade won’t cost me much, and as I’m already using both free and paid, I don’t need the rest of the premium features. Ads are a nuisance, though. I really should make time to deal with that. That was one of the things I was freaky about from the start. I figured if I was going to present myself as a published author I wanted that extra step of professionalism. I’ve never seen an ad pop up on your site, Staci. Do you mean on the free side? – the ability to build your email list. Most free WP bloggers don’t bother. On WP free, you can Mickey Mouse a form with a widget, but gaining subscribers is a slow process for some reason, much slower than with self-hosted. For authors, the ability for quicker sign-ups is a deal-breaker, IMO. Nothing beats direct marketing. – as Craig mentioned, I own my site. WordPress doesn’t. – the ability to code the theme the way you want it. As such, you won’t stumble across a blog that looks identical to yours. With WP free, you can play with CSS but nowhere near to the extent of self-hosted. – showcase books, excerpts, sneak peeks, rafflecopters, etc. With free you can still use your sidebar, but self-hosted’s possibilities are endless. – one of the most important aspects are the SEO capabilities. Targeted SEO allow bigger sites to notice you. Which in turn drives huge amounts of traffic to your blog. I’ll end this incredibly long comment with this: do what’s best for you and your goals. Ah, but I actually had to work to follow your blog, and still do to a degree to participate in comments. It is worth it to me, but how many new folks would find it offputting? Gaining new people is important to the process. True! But I look at it this way. Traffic vs. comments. If I’m gaining tons of traffic, fewer comments don’t matter to me. People reach out in all sorts of ways…on Twitter, via email, on Facebook, Google+, etc. If they don’t want to fill in the few details to comment, they’ll reach out to me on social media. It happens all the time. That’s a really good point. As much as I hate to admit it, I tend to visit all of those places on a daily basis. I have noticed that you get a lot more out of FB than I do, and this could explain some of that. Thank you for the detailed reply, Sue. I should have mentioned Sumo, but I didn’t want to get too bogged down in plugins. It’s a great one, though. And I only use the free parts of it. You’re right about custom coding. Self-hosted sites have a lot more originality and customizability. But a lot of people are afraid to try and don’t have the money to hire that out. It’s a trade-off, I guess. At the end of the day, you have to assess your wants/needs/abilities and do what is best for your situation. Exactly, Staci. This is a fantastic post for someone weighing their options. Between the post and comments it looks like all the angles are covered. Great idea, you guys! We may have to group together again some day and throw some more topics around. 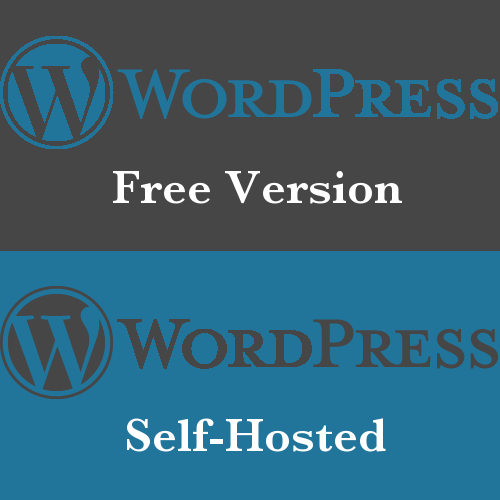 Check out this post from The Story Empire on the topic of free vs. self-hosted WordPress sites. I fall in the middle with a premium site. No ads and no headaches of self-hosting. Wow. This covers a lot of what I would say. I have a self-hosted author site since it’s supposed to be more professional. Did it through Weebly, but it seems to just sit there. I can’t interact with people and never know what’s going on or if stuff is working. Feels silly to come back to my blog and ask about the other site when I could just stick to the blog. One thing I have done is paid for a premium WordPress membership in order to own my domain. That was suggested at the beginning by a friend who pointed out that someone else could take it if I’m not careful. Beyond that, I prefer what I have because of the interactions. I’ve seen a lot of authors go to personal sites and many seem to lead to a level of isolation. It’s harder to share if you can do it at all in regards to reblogging. I get that you have more control over the site, but the trade-off seems to be a wall appears to make interactions more difficult. Now there is a hybrid solution I wish we’d included. This is why comments are so important. Avoiding that level of isolation is why I stick with the free version. It amazes me that people can get the personal site through WordPress, but it doesn’t allow for reblogging. Seems like that would be one of the key features to carry over. Almost like WP has it set up that you have two realms. Makes me wonder if other self-hosted on WordPress blogs can reblog each other, but the frees can’t. Wouldn’t know. It seems like if you buy the upgrade version it would do everything the free one does and more. Doesn’t seem to work that way though. I noticed that. I was talking to another author about it long ago and it sounded great. Then I saw that it didn’t do reblogs and the comments were a little screwy. Seemed like a trap. The JetPack plugin on the self-hosted sites gives a lot of functionality that the free version has, including limited sharing. You have to set it up, though. And no, self-hosted to self-hosted sites don’t have reblogging capabilities. I think not having the reblog option is the one shortfall of the paid site, but there’s a chance that the reblogging option is somehow tied to the communal functions of the free WP sites (that still eludes me). [ Smiles ] The self-hosted version of WordPress is for the tech-savvy kind of individual (An inexperienced blogger can actually break their site by messing around with their theme). The WordPress-hosted version is user-friendly, impossible to break and is suitable for newcomers to blogging. However, my preference would be the self-hosted version of WordPress, because of the freedom to use plugins and widgets. In regards to the Disqus commenting platform, I want people to know that it is very easy to use; they do not necessarily have to join Disqus in order to comment; they can do so by using the guest option. I get along fairly well with Disqus. There are other systems that don’t work as well. [ Smiles ] Fairly well? I think that Disqus works great! Renard, I haven’t had many problems with Disqus – only a few people who said they were unable to comment. Since I started using it, I’m not likely to change. One plus to using Disqus is that it will email people when someone responds to their comments. With the WordPress comment system, a person has to “subscribe” and they get notices for EVERY comment, not just their own. Thanks for the input! [ Smiles ] You are most welcome, Joan. I also use Disqus for my blog on Blogger and some people told me that they didn’t want to join Disqus in order to leave a comment. And, then I go through a detailed explanation on how to do so. For the record, I love Disqus! Disqus is easy, but it can be glitchy. I have never had a problem with the WP comment system. I have had a TON of problems trying to comment on Blogger sites. As for plugins versus widgets… Plugins are so much more robust. For beauty and easy, the self-hosted site with plugins is my preference (as stated above), but not for the blog, because of traffic issues (also mentioned above). [ Smiles ] When I had my WordPress-hosted blog, the WordPress commenting system worked flawlessly. Hmm. In regards to traffic issues with your self-hosted version of WordPrss, have you tried the Yoast SEO plugin? It should help in the area of boosting your incoming traffic. Craig and Staci, I enjoyed doing this group post. Hopefully, our words can help others in their decisions on the best blogging platform for them. That would be great, but I’m hoping for some discussion too. My goal is always to help people, and I hope this post does just that. Having read the post from all of you experienced bloggers, I’m glad I ‘m on the free WP. It does what it says on the tin, and I’m happy with the functionality. More to the point, I can manage it efficiently and it rarely lets me down. You could say I’m a better blogger/writer because of it. I’m the one who pushed the free site, so I’m with you. I have enough options to suit me, and it works fairly well. Thanks for the reblog. As long as it’s working for you, that’s all that matters! Craig, Joan, excellent points. I’m looking forward to any comments we get. Hopefully some success stories or words of wisdom from other users. Looking forward to some discussion myself. This was fun to build, but if we build it will they come? I was out with my daughter all morning. Just got back. Looks like they did! Some nice discussion going on. Good info too.